Hjem » Sol & Solarium » Solariumskrem flasker » Empire Black Bronzer Private Reserve 400 ml. 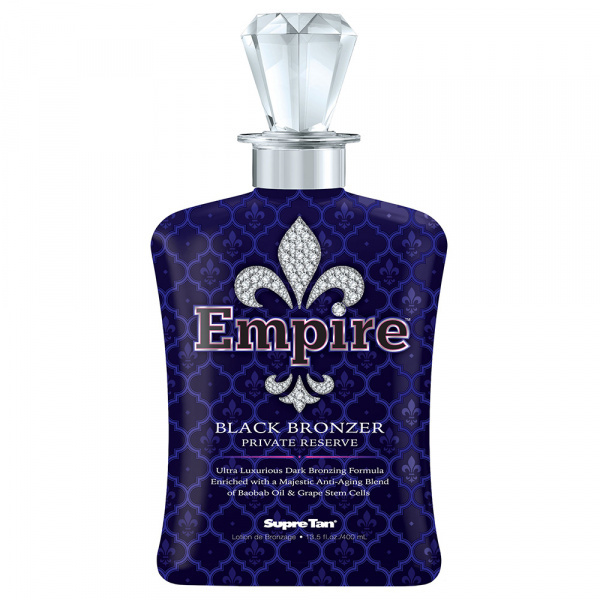 Empire™ Black Bronzer Private Reserve is the supreme authority in dark tanning fashion. This Ultra Luxurious Dark Bronzing Formula demands attention with its complex blend of Melanin Activating Peptides, Tyrosine and our exclusive DHA delivery system for dark and undaunted color. A Majestic Anti-Aging Blend of Baobab Oil and Grape Stem Cells renews your sense of style with a firmer, more youthful appearance. Your trendsetting color will command the room the moment you enter with Empire. • TrendingColor Complex™ features Melanin Activating Peptides and Tyrosine to help achieve richer, darker, golden color. Empire from Sun Evolutions on Vimeo.